In addition, it was puzzling that the majority of products were foreignn, when here in Denmark we have an agriculture industry and fisheries that supply some of the world’s best raw products. The result was UNIQ – high quality dog and cat food developed to create increased health and happiness for dogs, cats and their owners. 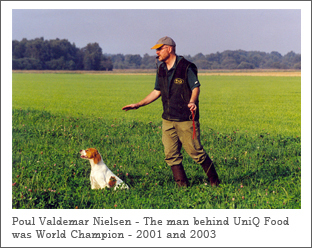 Today, UNIQ is the preferred dog food for many dog sports enthusiasts, which a number of winners within various dog sports are witnesses to.